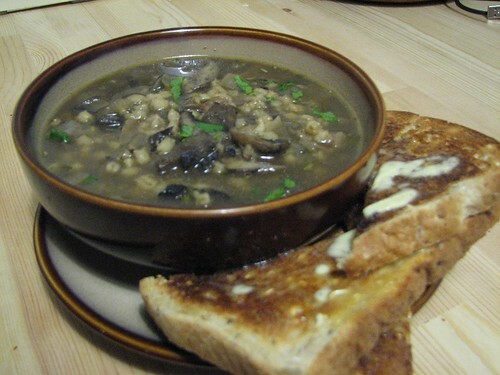 Mushrooms and Barley and Bears – Oh My! 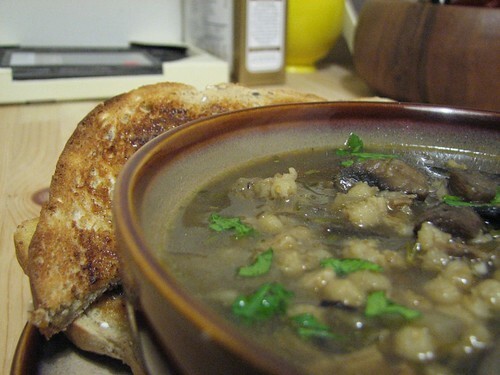 My Dad told me about this fantastic, hearty winter soup recipe he had made after seeing it on tv. Barley in soup always reminds me of my Nanny – she used to put pearl barley in her veggie soup and we would eat that soup, along with some homemade cornish pasties she had bought from church almost every Sunday in the Winter time when we would visit. I made a huge batch of this soup and froze half for easy week night meals — and it reheated no worries! Cook the pearl barley in the 7 cups of water for approximately 1 hour, strain. Once the barley has been cooked, melt the butter and saute onion until soft. Add garlic, rosemary, thyme, and chopped mushrooms and saute until soft. Strain porcini, reserving liquid. Chop the porcini mushrooms and add to the pan, along with precooked barley, stock, reserved porcini liquid and sherry. Cook for approx 20 minutes and season with salt and pepper.